Neither view is completely correct: the new cables are neither panacea nor placebo, but components whose characteristics must be evaluated in the context of their usage. Hoping to shed some light on the subject, I obtained samples of various cables, performed a number of tests, and drew a few conclusions. between cable types become more dramatic with increasing length and shrink toward zero as the cable gets shorter; thus the audiophile whose amplifiers sit close to his speakers need be less concerned than he whose cables are 40 feet long. To this end, some manufacturers have installed amplifiers within their loudspeakers, exchanging speaker cable problems for preamp ones; commercial sound distribution systems have resorted to higher voltages, which improve transmission much like the high voltage utility lines which carry power many miles. "Monster" cable, marketed by Audio Sales Associates in San Francisco, California, is an approximately 111/2 gauge twin lead, similar in construction to very large lamp cord with a thick clear plastic jacket, with large spade lugs at each end for attachment to large screw terminals on "five-way" binding posts as commonly supplied on loudspeakers and amplifiers. Lucas cable is approximately 14 gauge, jacketed in green plastic with a ribbon shape, and is marketed by S.O.T.A., Halifax, Canada. Fulton "gold" cable, available from Fulton Musical Industries with dual banana and other connectors, is an extremely large gauge twin lead having by far the lowest resistance of any cable tested; it is also useful for pulling up tree stumps or jump starting locomotives. Fulton also make a "brown" version similar to Monster cable. inductance, resistance and capacitance are approximated as components in a circuit, sectioned off per unit of length. In this example, the values are for simple 18 gauge "zip" cord and one foot lengths, so that L is the inductance per unit foot, R is the resistance, and C is the capacitance, measured in Henries, Ohms, and Farads respectively. As a practical matter, the values of these elements represent tradeoffs against each other: for example, low inductance is easily achieved with high capacitance and vice versa, and the ratios of these values give rise to the cable's characteristic impedance, as I shall discuss later. Researchers have chiefly concentrated on the cable's inductance and resistance, for they impede the flow of electrons between the amplifier and the loudspeaker. Resistance causes loss at all frequencies while inductance causes loss proportional to the frequency. Capacitance has not usually been considered significant because its values do not impinge upon the audio band. However, we will see later that it may sometimes important. The new kinds of cable seek to reduce resistance and/or inductance and thus improve the amplifierspeaker connection. They fall into two categories: multistrand twin lead of various gauges (lamp or "zip" cord being an example) and low inductance - high capacitance coaxial or interwoven types. Their measured performance also falls into two categories, 0-100kHz effects and 100kHz - 40MHz effects, which for convenience I will treat separately. My analysis was greatly simplified by the fact that within the two cable categories performances were very similar; indeed, many of the cables were virtually indentical at higher frequencies. I tested five different types of twin lead cables: 18 and 24 gauge "zip" cord and three specialty cables, "Monster" Lucas cable, and Fulton wire (gold). I bought two samples of each of 18 and 24 gauge wire off reels at a local Radio Shack and a hardware store. All the cables tested were 10 feet in length. The four samples of low inductance cable I tested boasted more exotic construction than zip cord. Two colorful types, Polk Sound Wire and Audio Source Ultra High Definition Wire, use large numbers of separately insulated strands closely interwoven in such a way that the wires cross at an angle to each other instead of running parallel. This reduces the magnetic induction between strands and lowers cable inductance, at the cost of higher capacitance. High definition cables, another variety of low inductance cable from Audio Source, consists of eight twisted pairs of wire arranged into a flat ribbon. Mogami wire is a large coaxial cable consisting of a grey plastic housing containing two concentric "shells" of wire strands, the inner conductor enclosing a plastic core. "Smog Lifters," another tested cable, is distributed by Disc Washer. It bears a resemblance to Audio Source's high definition cable, with loosely woven braids of conductor. Fig. 2 shows the relative values of resistance, capacitance and inductance of each of these cables. frequency loss in addition to the cable's resistive losses. Interestingly, all the twin lead types have similar cable inductance values, approximately 2uH per 10 feet, and in the region just above the audio spectrum they are nearly identical. Below 20kHz they fan out to their respective resistance values. The lightest wire, #24, clearly has the most loss, while Fulton cable has the least. 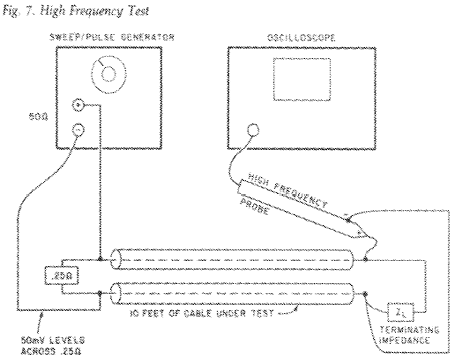 The series impedance test differentiates the low inductance cables from twin lead as they exhibit an order of magnitude less impedance at 100kHz. 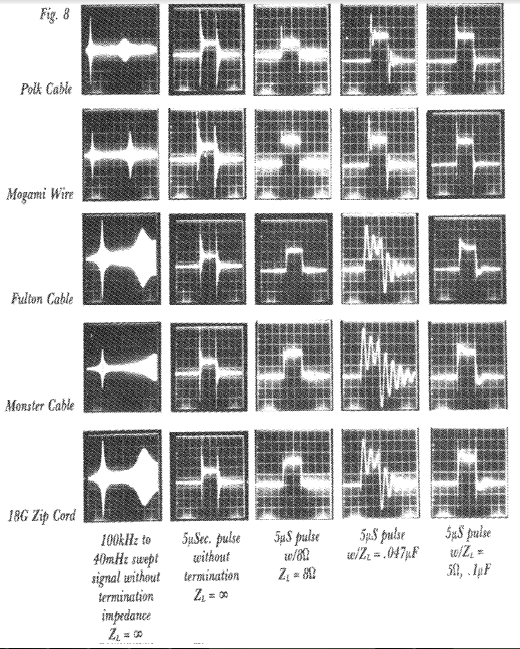 Of these, Mogami Wire had the lowest series impedance, by virtue of its lower resistance; but each of these types has to all intents and purposes inductance effects. 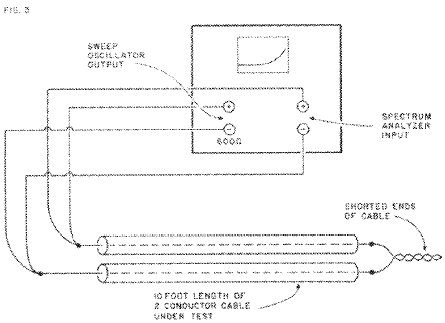 The series impedance is a more or less linear function of the length of the cable, so a one foot length will have one- tenth the series impedance shown while 100 feet would have 10 times the amount. 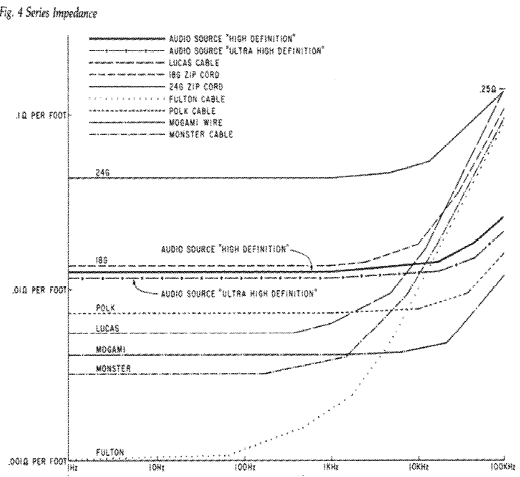 Ordinarily a discussion of loudspeaker cables would stop here, at 100kHz, where we could safely say that the performance is becoming negligible, if for no other reason than that we cannot hear this frequency (a concept disputed by some audiophiles). However, the advent of wide bandwidth power amplifiers has demonstrated other new effects; several amplifier designs (stable with reactive loads such as capacitors) oscillate into low inductance cables with a variety of results. Threshold Stax, and Electro- Research designs behave violently, while others acquire oscillation-caused colorations, usually either a hard, etched, high end or warmth and thickness in the vocal range (due to low order intermodulation sidebands and harmonics). Clearly things are happening above 100kHz; to display them I performed two tests on the cable samples. In the first I swept the frequency output of a 1/4ohm resistive source from 100kHz to 40MHz while measuring the voltage at the other end of the cable with various load impedances. In the second test, I used the same source to send a 5μS pulse down the cable for viewing at the other end. (see Fig. 7). Fig. 8 displays a condensation of over 50 photos showing the test system's response to each variety of cable and load. The unterminated "no load" series shows the equivalent performance of loudspeakers with a substantial series inductive component, while effects of resistive (8ohm) and capacitive (.047uF) loading appear in the following two vertical columns. In the frequency response, we see large peaks occurring in the 1-10MHz region. Remembering that we sent 50mV down the cable from the oscillator, it is surprising to discover amplitudes as high as 5V on the other endÄan apparent gain of 1001 As shown by the ringing in the pulse waveforms, this highly resonant condition occurs with every variety of cable, but at different frequencies and "Q" factors depending on the source impedance, the load impedance, and the type and length of cable. The explanation for this resonance is reasonably simple if we consider that it takes a certain amount of time for the signal to travel down the cable. A wave's velocity proportional to its "characteristic impedance,"
found it cures oscillation problems caused by the other exotic low inductance cables. It is necessary whenever a reasonably long length (>3 feet) of low inductance cable is mated with any wide bandwidth amplifier. It interacts unfavorably with twin lead conductors (Fig. 8) which require higher impedance values (say, .01uF, 60(2); however, twin lead's higher characteristic impedance and resonant frequencies are in any case unlikely to induce oscillation in amplifiers now available. With this much information, we might think we have the subject nailed down. However, we could easily install the finest amplifiers, cables, and terminating impedances and achieve 100 times the distortion of the amplifier alone. Loose, dirty, or oxidized connections can, while measuring well with an ohmmeter, cause high amounts of harmonic and intermodulation distortion. When high distortion occurs during an amplifier checkout at Threshold one of the first things we do is replace or tighten the cable from the amplifier to the load; we have thus cured many "defective" amplifiers. Copper and aluminum oxidize quickly and oils from our fingers find their way to the conductor surfaces, causing poor contact; so on more than one occasion the dramatic improvement provided by an exotic cable has merely demonstrated the extremely poor quality of the previous cable's long neglected connections. Wire connections can age, and anyone wishing to accurately evaluate the newer cable's improved quality should first renew the contacts on his current set. Banana plugs and five-way binding posts make excellent connectors as long as they are kept clean; however, while the connector's plated surface resists corrosion, the wire to the connector interface can become bad and should be periodically checked, especially if it is subject to motion. At this point many audiophiles are wondering, "Where are the listening tests?" 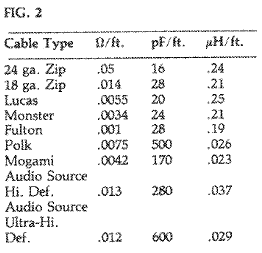 I have listened to these cables on a variety of amplifiers (mostly my own) and loudspeakers, including Magneplanar Tympani 1 D's, MG II A's, modified Dayton Wright XG 8 MK III's (as shown in Fig. 6) Cabasses; I have also heard some examples on Dahlquist and Snell loudspeakers. response deviations. Fig. 5 gives an example of such a case, where the aberration is relatively minor; however, Fig. 6 shows the effects with one particular loudspeaker (which really exists) where the deviation is dramatic. Just as the cables have an inductive element, so do the amplifiers which drive them. In tube amplifiers the output transformers provide the inductance whereas in most solid state designs the designer has deliberately provided inductance in the form of a coil for added circuit frequency stability. The reason that damping factor (8ohm/output Z) has been traditionally quoted at low frequencies is not only because much of our interest in damping centers on the woofer, but also because this coil destroys the damping factor at high frequencies. In fact, examples exist of solid state amplifiers which quote damping factors of 500 or greater at 20Hz but which have damping factors on the order of 15 at 20kHz. More recently a few designs (Threshold, Audio Research, Yamaha) have dispensed with output coils, giving them more constant damping factors across the audio band. The new IHF test standards call for measurement of damping factor at all audio frequencies. Again, this parameter must be evaluated in the context of the system. 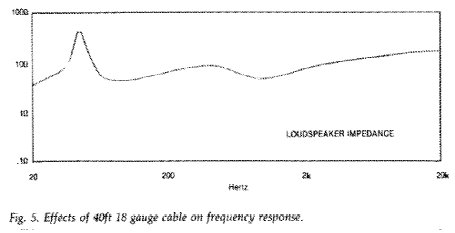 For example, most loudspeakers have a considerable inductive component of their own, which may easily provide the desired case of amp Z + Cable Z < speaker Z. Conversely, the source and cable inductances become more important with loudspeakers whose load impedance is resistive or capacitive, especially with some electrostatic designs. Our initial premise does not always hold either, for I have seen "poor quality" cables used to isolate an amplifier from a reactive loudspeaker and thus improve the performance. In general, however, we are looking for amplifiers with low output impedance and cables having low series impedance. When a wave travelling down a length of cable reaches the end of the cable, it will do one of three things depending on the impedance of the load. If there is a high impedance load, so that ZL, > Zc, the load will reflect energy positively back down the cable to reappear at the source (Fig. 9). If the load impedance is less than the characteristic impedance of the cable, the wave is reflected back negatively; and if ZL = Zo, then the wave is fully absorbed and none is reflected. Note that these effects exist with all cables. The fact that only the newer, low inductance cables appear to affect amplifier stability brings us to a point which justifies our examination of a cable's performance in regions which are simply not audible. The lower resonant frequencies of the cables having low Zo enter into the output bandwidth of the amplifier as it approaches its unity loop gain, and by altering its phase response cause oscillation at the resonant frequency. Earlier amplifiers as well as some currently available, having slower output stages (less than 1MHz), did not interact with these resonances because they occurred above the cutoff frequency of the active devices by an order of magnitude. 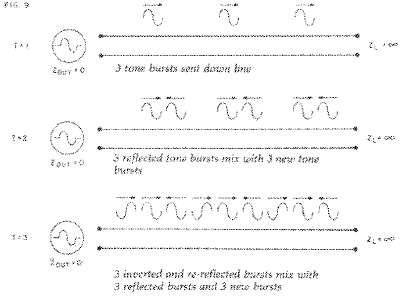 However, as the newer cables decreased impedances and as amplifier output stages increased in bandwidth beyond 5MHz, the two effects met and resulted in various forms of sonic problems, fuse blowing, and worse. At Threshold we first ran across the problem with the mating of our 400A and Polk sound cables which caused fuse blowing (due to oscillatory cross-current conduction) with great regularity. Frankly, I found it difficult to assess the results except at the extremes of performance. For 10 foot lengths with properly terminated cables and speakers with inductive high frequency characteristics, the differences between low inductance cable and twin conductor are extremely subtle and subject to question. With a low output inductance amplifier and a Heil tweeter (whose impedance is a nearly perfect 6ohm resistive) the difference was discernible as a slightly but not unpleasant softening of the highest frequencies. Fulton or Monster cables were a clear improvement over 24 or even 18 gauge, though a little less subtle than I would have expected, leading me to believe that the effort associated with heavier cables pays off in bass response and in apparent midrange definition, especially at crossover frequencies. The worst case load, the modified Dayton Wright electrostatics, presented some interesting paradoxes: the extremely low impedance involved showed the greatest differences between all the types of cables. However, the best sound cables were not necessarily electrically the best because several amplifiers preferred the highest resistance cable. In one case, I had to use 24 gauge cable to prevent tripping the amplifier's protection circuitry. Who am I to dispute the feelings of audiophiles who, evaluating any cable in the context of program source, amplifier, speaker, and listening room, decide they can hear the difference? A few guidelines have emerged here, but the final judgment belongs to the user. All the special cables mentioned worked well on the test bench and, given the assumption that series impedance should be minimized, all of them work better than 16 gauge wire. If, like many audiophiles, you have spent a small (or large) fortune on your hi-fi system, money spent for high quality cables and connectors is a reasonable investment. a. Fulton Speaker Cable. Fulton Musical Industries, 4428 Zane Ave. North, Minneapolis, MN 55422.
b. Mogami Speaker Cable. At press time we are unable to locate a manufacturer or distributor for Mogami. c. Polk Autio Sound Cable. Polk Audio, 1205 South Carey Street, Baltimore, MD 21230.
d. Ultra High Definition Speaker Cable. Audio Source, 1185 Chess Drive, Foster City, CA 94404. 2. Hiraga, Jean, "Can We Hear Connecting Wires? ", Hi Fi News and Record Review, August 1977. 3. Retsoff, Alexander, "Retsoff's Remedies ," Stereo, Fall, 1978. 4. Klipsch, Paul, "Speaker Wire," Dope From Hope, Sept. 13, 1978. 7. Greinier, R. A., "Another Look At Speaker Cables," Speaker, The Boston Audio Society, Dec. 1978. 8. Gross, T. A. G., "Multistrand Litz Wire Adds "Skin" To Cut AC Losses in Switching Power Supplies," Electronic Design, Feb. 1, 1979.